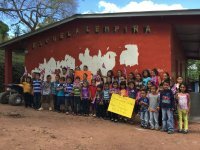 This school is located in the village of Chiquistepe. There are approximately 60 students up to the age of 11. Many of these students live some distance away and some walk up to six kilometres to attend school in all kinds of weather. Keith visited the school in January 2015 on the day that they were having their annual Christmas meal (slightly delayed!) which was sponsored by CH Trust. ‘Good morning, I am the Headteacher of the Lempira School in the village of Chiquistepe. My name is Rut Noemi Serrato and I have been working here for the last seven years. Since I began, thanks be to God, the organisation has helped us a great deal. 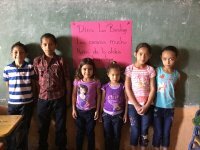 In terms of child sponsorship, we began with 15 sponsored children and now 35% of children are sponsored both here in Chiquistepe and at other schools. The organisation has helped these children a great deal with the provision of uniforms, ruck-sacks, notebooks and pencils at the start of each School Year. This assistance has been a great blessing for the children because they come from very poor families. Many of the parents do not have any form of work. Those that do work are only employed for six months in the sugar refinery and when the season finishes in August they dedicate their time to growing maize and beans for their own consumption. These children have also benefitted from the provision of boxes that come from England each April. The children are very happy about this because the boxes contain food for the whole family and also toys for them which is something they may never have received before. So you can see that the organisation has been a great help. Also we have here one of the rooms in the school. The organisation helped us with the guttering and the roofing and this was one of the largest projects that we have undertaken. It was necessary to replace the ceiling because previously every time it rained we used to get wet. Well, all sorts of things have happened to us but thanks to the help received from the organisation we have managed to carry on. The organisation has also blessed the people in the village a great deal by providing help. A good example of this was the distribution of chickens (some 15 chickens to 4 needy families). They had no chickens but now they even have chicks that have hatched. Sometimes we simply don’t have the words to say ‘thank you so much’ to those in the organisation for all that you do. For example, the Christmas lunch that we have once a year. 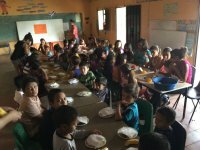 The children are very happy because they have this special meal each year thanks to your support. Also for the educational material, for the chairs and for the tables that previously we did not have and now we have our own chairs, tables, educational material, pencils, colouring pens, marker pens as well as whiteboards. Thank you once again to everyone at CH Trust and also to Jennifer Cox, the coordinator.